Beautiful picture above, isn’t it? 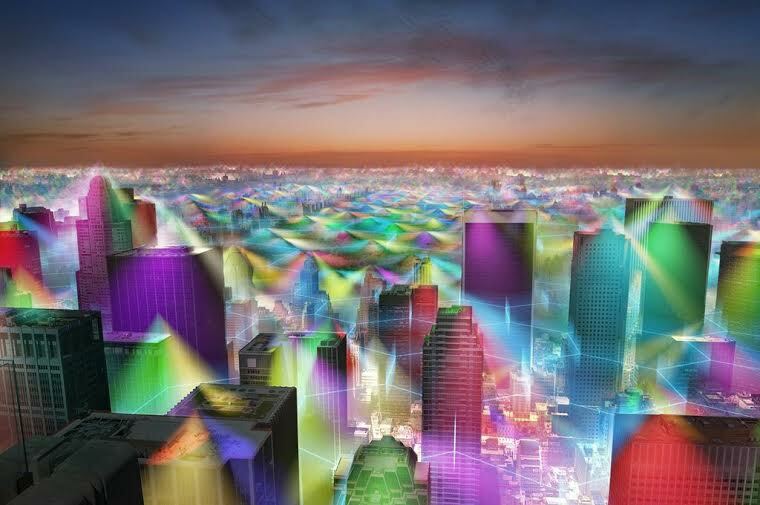 Don’t be deceived; the color you see is the electromagnetic radiation fields from cell phone towers over New York City. Atop office buildings where workers spend 8-10 hours per day, and apartment buildings where people live the remainder of their days “safe” in their homes, RF radiation is pouring down into their spaces without consent or being made aware. There are conflicting reports available to the public regarding whether these RF fields are dangerous to people. Some claim that without transmission (two directional signal traffic to and from a device), the signal is harmless. Others will discuss that the wave is present regardless of the direction of transmission, and in such high quantity (note the amount of signal overlap in the image above) it is dangerous for constant exposure for any living organism. While we may not have any say in the cell phone towers down the street without tackling a high-profile case against the tech giants who own these towers, we should be aware of the antenna we do control. A cell phone has an antenna much like these monster towers, and communicates the same way, though on smaller scale. It uses RF radiation technology to send and receive packets of data, all of which are translated and shown on your handheld screen. Now, when you place a phone call and put this antenna less than an inch from your brain, these packets of radiation are emitted in all directions from the antenna, including your hand, and your head. In fact, depending on the geometry of the cell phone and the location of the antenna within the cell phone body, between 20% and 80% of cell phone radiation is deposited into a user’s head. To many of you readers, this probably doesn’t come as a surprise. A poll from 1999 (well before smartphones and the sophisticated technology we have 15 years later) indicated that 40% of cell phone users were concerned about the health implications of using such technology. The world is paying attention, well beyond the United States’ action. In the UK, students are taught how to use their mobile devices safely, and Britain’s largest police force has instructed their staff to limit cell phone conversations to 5 minutes in length. The World Health Organization has launched a 5 year study into the rise in cancer rates attributed to cell phone use. Well, yes, and no. When it comes to cell phone tower radiation, there is little you can do outside of lining your home in radiation shielding (which is very cost prohibitive, and if you plan to keep using your cellular devices, impossible) or leaving the area for a rural setting with no cellular signal. With regard to your mobile device, speaker phone or wired earbuds are without a doubt the best mode of operation. Any distance you can keep between your brain and your cell phone is beneficial. Keep your cell phone out of your pocket; the device and the nearest cell tower are in constant communication with one another, as updates about text messages, emails, and app activity are results of non-user-prompted communication. Stay in the know, stay safe.